NOTE BY NORSE: Santa Cruz’s downtown main drag, Pacific Avenue, is now a curious scene of regular violation of the new Downtown Ordinances that exclude 95%+ of the sidewalks in business districts from sitting or setting up a table. The laws impact anyone with a “display device”–expansively described as “anything capable of holding tangible things” (i.e. a cup for a panhandler, a table for a political petitioner, a guitar case seeking donations for a busqueer). Almost every singer, sitter, performer, or vendor that I’ve seen is in technical violation of these ordinances since so much obviously innocent behavior is simply rebranded as “criminal”. This fits in nicely with the right-wing claims of a homeless “crime wave” requiring public money and police attention–soon to be ceremoniously announced by Mayor Bryant’s new Citizens Task Force on Public Safety (http://www.cityofsantacruz.com/index.aspx?page=1924 ). Obviously uninterested in going after every instance of sitcrime, strumcrime, or sparechanecrime, cops and their cheery parapolice pals the “Hospitality” Hosts walking the beat beside them pick and choose who to harass and “move along” or ticket. The casual and regular use of selective enforcement has soaked its way deeply into political acceptability as to be clearly visible almost any time of day along Pacific Avenue. That’s not enough for some CSO’s (Community Service Officers) who reportedly loom over homeless folks thumbing through their ticket books announcing new unwritten crimes that require the sitter to be 50′ from a crosswalk or building. Or suddenly a Host announces the homeless sparechanger is sitting in a “performance zone” (of which there are none) and must move on. And seeing to get a permit to play music or display artwork in more than 12 square feet is generally not an option, except in a very few locations (See “Shrinking Sidewalks and the Permit Fantasy” at https://www.indybay.org/newsitems/2013/11/09/18746169.php ). Some homeless wiseheads are learning to justify either their peaceful panhandling or their simply sitting by making colorful signs and selling them as artwork; this is similar to the brief rush of kazoo players a decade ago that hit the avenue when expanded forbidden-to-sit zones were created for homeless people but not those “performing”. And mass ticketing of homeless people continues in San Lorenzo Park as recently as 11-10, according to one rudely awakened sleeper. 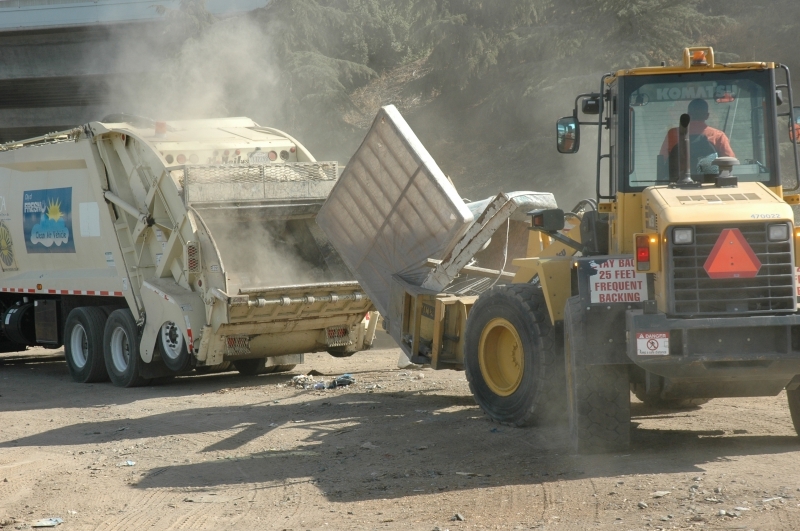 Property seizures are still a relatively ordinary occurrence with receipts haphazardly given, much property being taken to the city dump, and the police property room open only two days a week for two hours on those days. Coming up next at City Council tomorrow afternoon–investigation into the feasibililty of cracking down on homeless recyclers by relocating recycling centers to more distant places or eliminating them entirely. The City Attorney has already reluctantly told the bigotbackers on the Council that this conflicts with state law, but the “cut off all survival avenues” staff presses on. Julie Hendee, a particularly nasty entrenched city staffer was recently heard scolding a church group for feeding people in public on the sidewalk, urging them to move indoors and out of sight. Food Not Bombs soupslinger Keith McHenry reports on crackdowns across the country against FNB food servers (http://anarchistcook.wordpress.com ). Fresno, at least, is still the site of an ongoing lawsuit against earlier police violations (see http://www.necn.com/12/27/12/Fresno-homeless-lawsuit-survives-legal-c/landing_nation.html?&apID=d6771ce98a814833907a33ec0be52b35 and http://weap.org/humanrights/the-pursuit-of-justice/homeless-victory-in-fresno-has-implications-for-the-nation—by-mike-rhodes.htm). 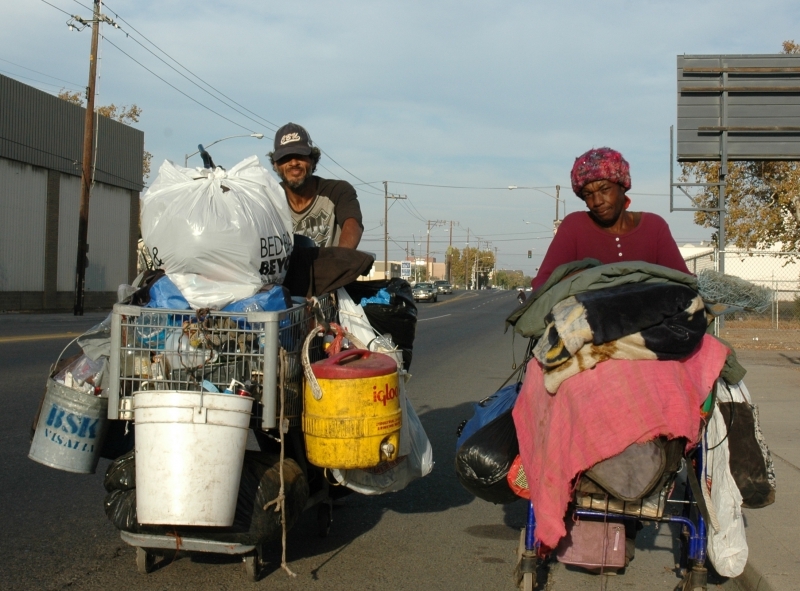 Are Homeless People’s Human Rights being Violated in Fresno? Homeless people in downtown Fresno, like the two in the photo below, are being harassed by the Fresno police. They are being told they can’t sit on public sidewalks, their property is being taken, and some say their constitutional rights are being violated. “They told me I could not sit on the sidewalk and that I could only stay if I sat on the curb with my feet in the gutter, or if I sat entirely in the gutter,” Lori (not her real name)* told me. “A friend of mine got a citation for sitting on the sidewalk, because her sleeping bag and other stuff was beside her.”Violet (not her real name)*, a homeless woman who lives near the Poverello House, confirmed that citations are being given by the police to people who have their property with them. “If you go into the Pov (the Poverello House – a homeless social service agency in downtown Fresno) to eat and you leave your stuff on the sidewalk the police will take it,” Violet said. If homeless people have property with them they are being cited for having “debris on the road” and if they leave it for a few minutes it is hauled away. One woman told me she had been taken to the hospital and when she returned everything she owned was gone. 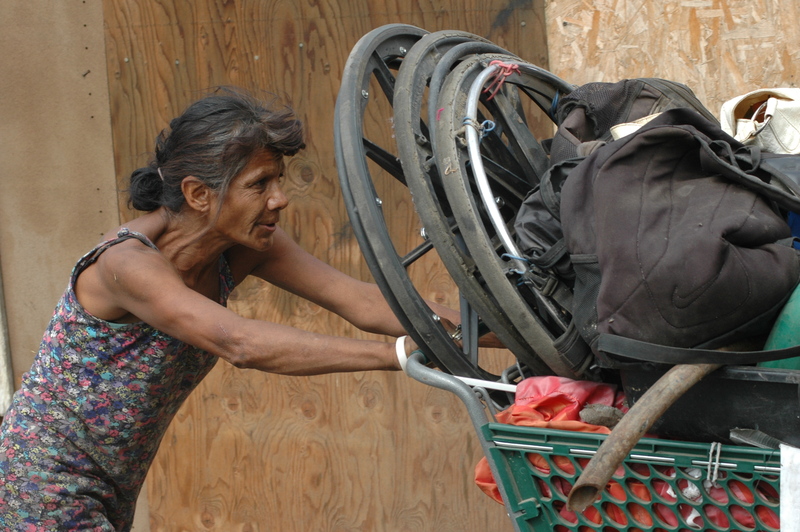 She does not know if the police took it, but said that even if they did she could not re-claim it, because she is too sick to walk to the storage facility and carry it back. She begged me for a couple of dollars to buy some adult diapers, to replace the ones that had been taken. Down the street, Ben (not his real name)* said that on Saturday he had received a sleeping bag and tent from a the Sleeping Bag Project. He put up the tent on Santa Clara street Saturday night. In the morning he got up to go to the bathroom, but when he returned it was gone. He is sure the police took it. Violet said the same thing happened to her daughter a couple of days ago. “She was gone for a few minutes and when she returned, the tent was gone,” Violet claimed. “The police come every morning at dawn and kick our tent, yell our names, and tell us to get up and move on.” Violet says that the harassment is so bad that she and her friend have to take shifts watching their property. Sometimes she will go eat at the Poverello House and sometimes her friend can go. They can only go together if they hide their property somewhere that can’t be found by the police. Mike Rhodes is the editor of the Community Alliance newspaper. He can be reached by email at editor [at] fresnoalliance.com . * Homeless peoples real names are not being used in this story out of concern of retaliation. NOTES FROM NORSE: Fresno activists, provide material support (portapotties, toiletries, a water source) to existing encampments in Fresno (with no legal authorization from authorities or financial support from government sources). Fresno activists also rush to encampments being dismantled, document the havoc being wrought by authorities, and even actively resist that destruction by placing their own bodies on the line. Santa Cruz activists content themselves with e-mail reports (like this one), appeals to political and community authorities to create a “Sanctuary Camp” , NO support or regular documentation of the tightening grip about the throat of the local Santa Cruz homeless, touchie-feelee “let’s understand the homeless” sessions, and chats with public officials in the airy hope of finding a “solution” acceptable to a homeless-hostile City Council. Meanwhile police crackdown on those who rest, socialize, display their art, or perform for donation downtown as well as sleepers with no legal place to be at night. The latest assault is City Council’s scheduled research into an anticipated attack on homeless recyclers at City Council today at 3 PM. For many years now, local churches, masjids, synagogues, and temples—their members impelled by a desire to reduce suffering in the homeless communities of Fresno, California—have raised funds to purchase fire-and water-resistant tents. So have conscientious, albeit agnostic residents in this city. Such tents are vitally necessary to the lives of homeless people, and are to be the only form of shelter in any campground the City will permit on the proposed public campgrounds to be discussed in this paper. 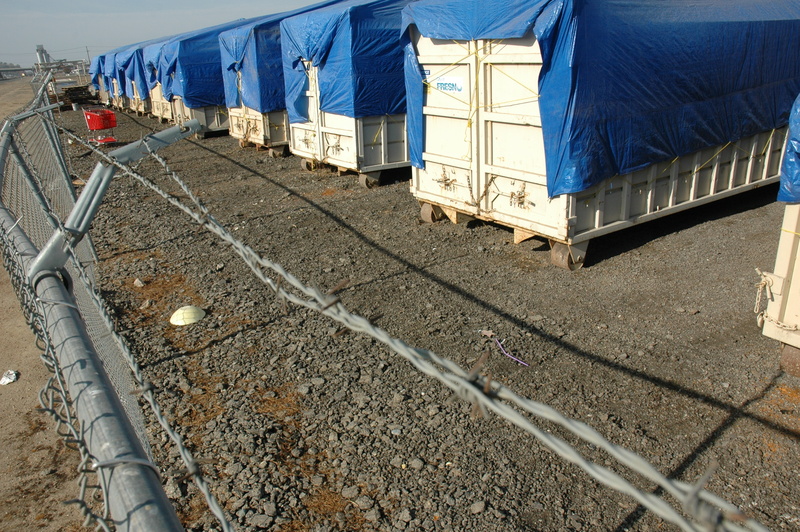 However, without assurance that, after the tents are set up, neither the City nor any other public entity will declare a “cleanup” only to tear the tents down and store them in bins virtually inaccessible to the owners of the much-needed tents awaiting alleged abandonment thereof, the religious, spiritual, and just plain decent impulses to live and let live would be imprudent. 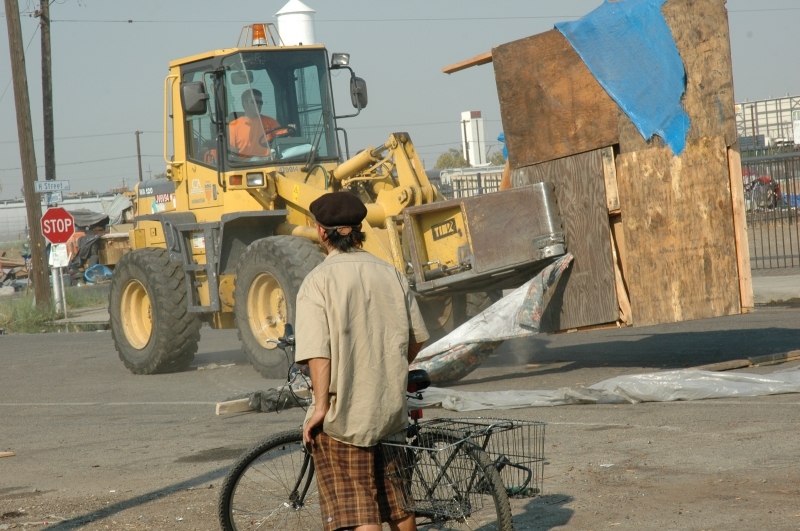 Our modest efforts to alleviate such needless suffering in our community would be frustrated by a City impelled by alleged concerns of health and safety necessitating abatement of each and every homeless encampment under the terror of the City’s territory, including even that which had been set up near the grain silos where concern for neither health nor safety appeared to anyone yet on this past October 23rd suffered the fate of all other woebegone people who, though lacking customary homes, seek to keep body and soul together. They seek to survive, despite the edict of some less-enlightened, if not benighted institutions whose leaders have the audacity to declare them to be mere street people or “infidels,” allegedly alienated from the dignity which we know to be inherent in every natural person. Now, therefore, we have come to realize that definite steps must be taken so that our efforts to alleviate such suffering will no longer prove vain; that tents and sleeping bags purchased with hard-earned money for the health and safety of homeless people undoubtedly living harder lives do not end up forever lost to their owners as a result of measures allegedly taken for their health and safety; and that the people who need these donated items may use them safe and secure in the knowledge that the land on which they do is legally available to them under reasonable conditions and not a labyrinth of rules and regulations, such as are imposed at one facility housing some two percent of the local homeless population, while the remaining 98 percent endure waves of officially sanctioned repression. Since solutions concerning availability of land to those people who truly need it, must come through the legal system, it is self-evident that solutions will be wrought in that system. If traditional politicking—letter-writing, lobbying, petitioning, and picketing—were enough to bring about the necessary land reform, it would have been achieved long ago in an area with plenty of food and land to share. 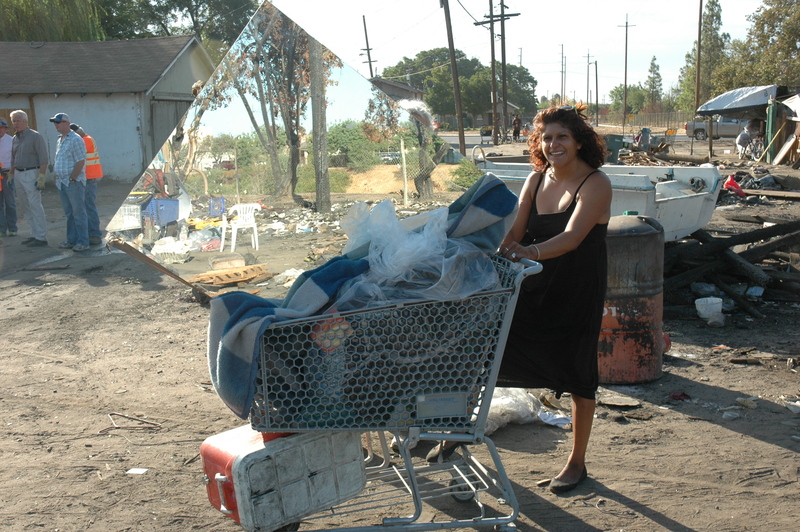 We know solutions to homelessness must exist in Fresno, land-poor though the city is. The area is very rich in land and the foods grown here. Land, food, tents, and sleeping bags are primarily what the homeless people here need. If the City would but open public lands to the public—a seemingly obvious proposition—caring, socially responsible residents will see to the other three needs. A reasonable legislative body will open public land as a campground if furnished with unlocked bathrooms with running water for rinsing one’s hands, a duty of personal hygiene which most of our homeless wouldn’t shirk if given the chance, and if not entirely forgotten after having been locked out of public bathrooms downtown for so very long. 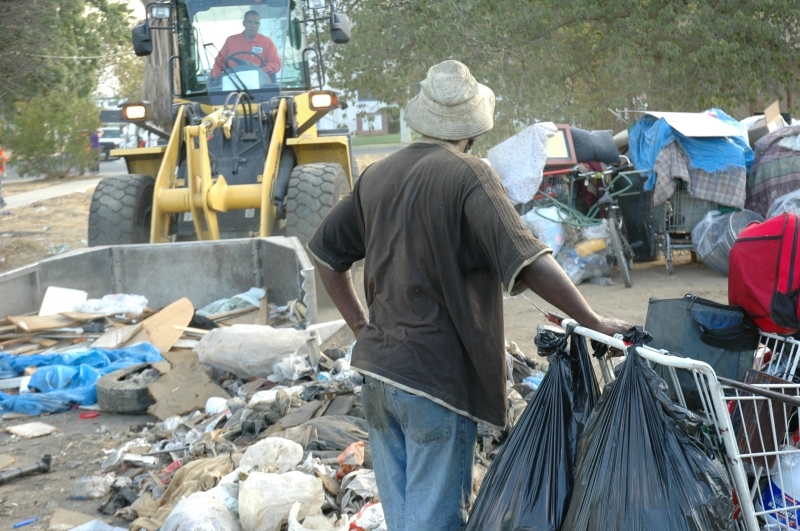 With the bathrooms and dumpsters that will be made available to them, the living conditions of homeless individuals will satisfy the “health and safety” requirements of which local public politicians and officials drone in their attempt to justify “cleanups.” And a court of law could find a campground with these basic amenities of hygiene satisfies those requirements, often cited by those officials, though by means never the officials intended: Unimproved public land opened as a campground for (homeless) members of the public! 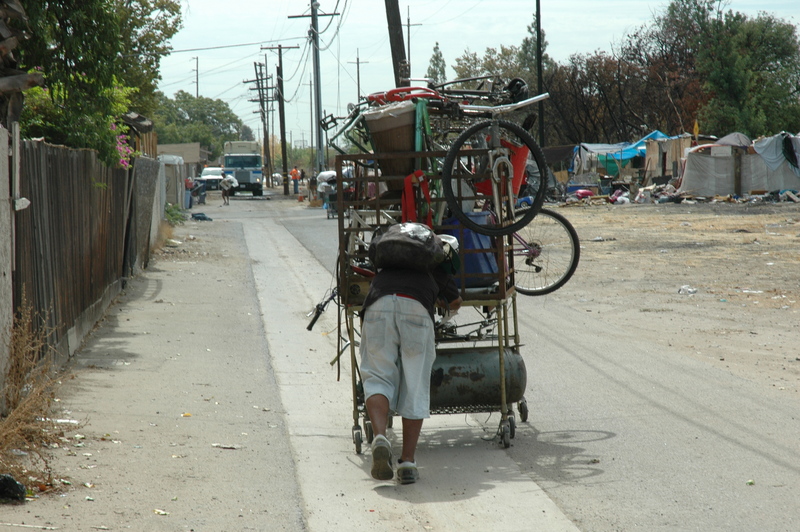 Most homeless individuals in Fresno, California need access to public services which are delivered downtown. Selecting the location of a proposed campground is usually made with that consideration in mind. Though land is plentiful, vacant public land is not. Selection of potential sites, which the writer makes using the City’s website (http://gis4u.fresno.gov/viewer/), is a quest for all of the prerequisites the City must satisfy to use the law empowering it to open unimproved (or vacant) public lands; to avoid schools and parks incurring opposition to a proposed campground; and of course to choose location where it’s possible for us to enable (homeless) campers to meet the basic necessities of life. The City, by erecting a barrier on the perimeter of a campground, addresses its said liability if it takes a precaution against a motorist who (using due care) tries to make a U-turn crossing into a proposed campground or negligently crosses into it. The barrier need not prevent any possibility of a large truck from entering one of these proposed campgrounds. However, it must be so constructed as to make entry thereinto by a motorist an act of negligence entirely on his part, and not the City’s. It must be high enough above ground level and present a vertical face to the average motor vehicle that would alert any responsible motorist he is violating the boundary of the street and putting life and limb at risk. Additional study is necessary to determine the specifications of the barrier. In virtually all other conceivable cases, the City is immunized under Government Code, section 835 for any injury resulting from third-party conduct. Access to potable (drinkable) water will remain a challenge for occupants of a proposed campground. Such water is not furnished in all wilderness areas, governed by the same law (ch. 2 of the Tort Claims Act, contained in Cal. Gov. Code, §§ 830—840.6) as that under which public land will be opened within our city limits. Where potable water is not available, a bathroom faucet may be set to produce only a trickle of water for cleaning one’s hands, discouraging its consumption and satisfying the minimum requirements of the Health and Safety Code. We anticipate that occupants in outlying campgrounds lacking running, potable water will, at least over the short term, demonstrate the self-reliance, resourcefulness, and cooperativeness of homeless people of former tent cities “cleaned up” or destroyed by the City. We believe that they’ll secure and replenish drinking water for their own communities. “Fire rings” are shallow concrete basins, usually about 4 feet in diameter. (Historically, these were used on California beaches, both for recreation (bonfires) and cooking, though they’re now banned on most of the state’s 108 public beaches.) Barbecue pits tend to be deeper. The California Fire Code is contained in Part 9 of Title 24 of the California Code of Regulations (www.calregs.com). The San Joaquin Air Pollution District has jurisdiction to give prior approval permit any open burning under conditions stated in the District’s authorization (Cal. Fire Code, § 307.2.1). And if an open burning “creates or adds to a hazardous or objectionable situation,” the fire code official may order such fire extinguished (Id., § 307.3). To keep themselves warm in wintertime, homeless people would probably be happier with a fire 15 feet away, rather than 50 feet away from any structure. Generally, an open burning must be 50 away (Id., § 307.4). However, if built in an “approved container,” a fire may be as close to a structure as 15 feet therefrom (Id., § 307.4, exception 1). But if the pile size is 3 feet or less in diameter and 2 feet or less, the fire must be at least 25 feet away from a structure (Id., § 307.4, exception 2). Selection of a campground may require consideration that a fire may create a hazardous or objectionable situation on certain lands. The first of three proposed locations could produce such a situation, requiring further study. Just to the east of the Fresno Regional Sports Complex are three large tracts of vacant land, presumably publicly owned. Their current use is actually non-use; they’re vacant. The City’s current plans are to use them as an open space/regional park, which would be adjacent to the sport complex. With respect to the intersection of S. West Ave. and W. Annadale Ave., the tracts are on three corners, excluding the SE. The tracts to the NE and NW of the intersection span almost as far N as W. Jensen Ave. The tract on the SW corner is about half the area of that on the NW corner of that intersection. All three tracts are remote from residential parcels. The Fresno Homeless Advocates may propose that the City leave all three tracts unimproved, except for the paving of roads, construction of bathrooms, and furnishing of dumpsters and access to sanitary (though non-potable) water. These public works do not “improve” the land such as would remove it from coverage by section 831.2, supra. But these public works furnish the land with the basic necessities of an overnight, long-term campground. 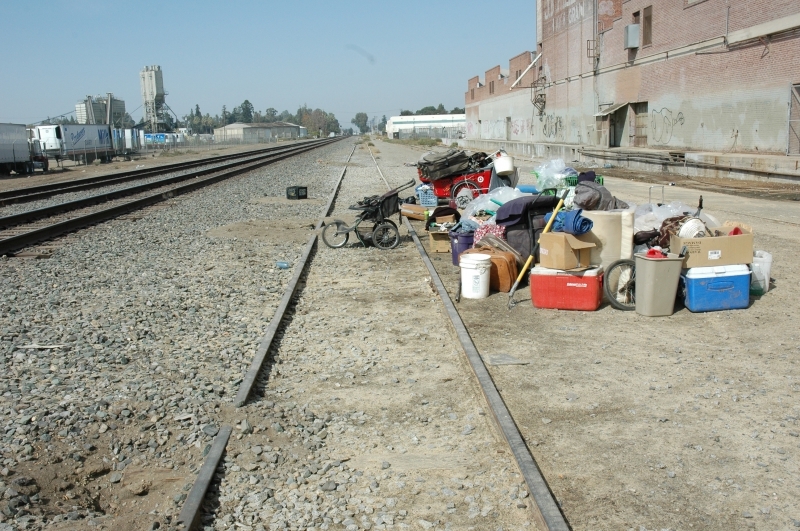 The Fresno Homeless Advocates may propose that the City revise its plan accordingly. We anticipate these proposed campgrounds will comport with the City’s recent (Nov. 9, 2013) recoding of the nearby Running Horse property, now called Mission Ranch, for large-scale commercial farming. The presence of such farming implies the absence of residences and schools, which would likely incur opposition to the proposed campground. However, a threat to the feasibility of a campground on this tract appears if the vacant land, like the sports complex adjacent thereto, is reclaimed landfill. If so, methane emissions would appear to present a safety hazard to anyone using a controlled fire on such land, whether for cooking food, bodily warmth, or storytelling or other fireside recreation. The heat of a barbecue pit could raise the temperature of the soil on which it rests, possibly resulting in methane emission at dangerous levels. And if methane were emitting on hotter days of the year, any fire could present even greater risk to the public. Two vacant parcels lie to the S of the intersection of S. Cherry and S. Railroad avenues. The parcels are particularly helpful to those homeless individuals who have difficulty cooking for themselves, and/or mobility issues hindering them from walking long distances. The parcels are only 0.6 mile away from the Pov’, an estimated 12-minute walk (or wheelchair ride). To the S of those two are three more, also in the 93721 ZIP code, i.e. : Parcel Nos. 28282828 and 23202320, both lying to the SW of the intersection of E. Florence Ave. and S. Tulip St. These are 1.1 mile away from the Pov’, an estimated 21-minute walk. While constructing restrooms on all public campgrounds, including both of the parcels at Cherry and Railroad, the City would do well to furnish the two last-mentioned parcels with ramps leading to the restrooms. The City, as any public entity, is not required by the Americans with Disabilities Act to make every recreational area accessible to disabled individuals. But, to fulfill the ADA’s purpose of making public facilities equally available to disabled individuals, the bathrooms at the 93721 campgrounds should be furnished with ramps. In the 93706 ZIP Code, there’s a cluster of five parcels, all of which are listed as vacant land. In the industrial corridor, no residential parcels or public parks are nearby. Nor are there any schools, the nearest being the Teocalli Dance Academy, which is 0.3 mile to the northwest. The cluster of parcels has one which is fairly remote: A large parcel on the SW corner of the intersection of E. Church Ave. and S. Golden State Blvd. Just 0.1 mile to the west of that intersection is S. Sarah St.; on that street, 475 feet to the S of Church is Foundry Park Avenue, from which the same corner lot is accessible. Continuing 0.2 mile on Foundry Park Avenue (past Wilson’s Motorcycle), the said avenue comes to a fork: A 0.2 turn to the NE, connecting with Golden State, and the same avenue continuing SE another 0.1 mile to reach Ry-Den Truck Center at the cul-de-sac. The four remaining parcels in the cluster are on either side of the 0.2 mile long avenue connecting to Golden State. Assuming campers have some means of transportation, they’ll have two services within their reach. The Turning Point G Street Residential Re-Entry Center is just 0.3 mile to the northeast, an estimated 7-minute walk on Golden State Boulevard. The proposed campground will be convenient for recovering addicts. The Pov’ is 1.4 mile away—an estimated half-hour walk or ten-minute bicycle ride—mostly along Golden State Boulevard. Using this route, which is low traffic and also the shortest to the Pov’, campers will avoid the dance academy, which is the only public facility in the area. In our quest for legally sustainable, politically suitable, and truly feasible solutions to homelessness, we are confronted by chapter 2 of the Public Tort Claims Act. This chapter contains laws permitting a public entity to open unimproved public land to the public. 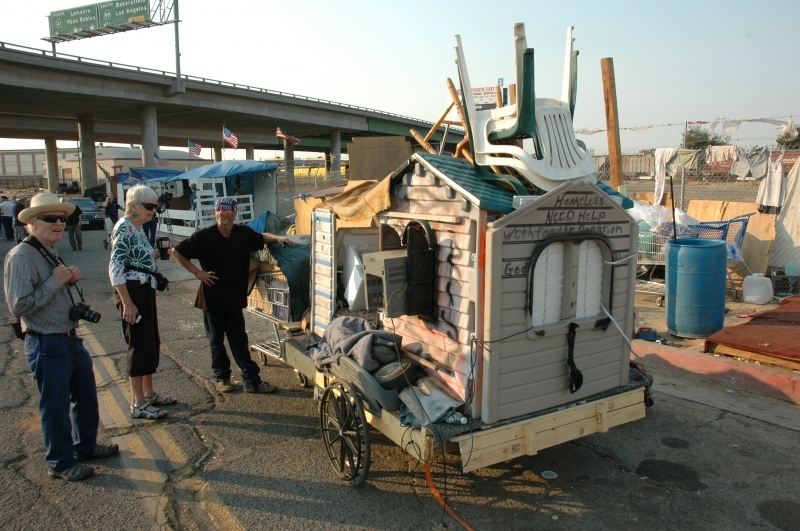 To provide a base of stability for Fresno’s harried homeless population, we propose homes be made available to them in the manner of a campground. Such a proposal appears the quickest for the great majority of the people and the least costly without jeopardizing life and limb, let alone the immorality of the City’s apparent war against homeless individuals. To that end, we have moved that the Fresno Homeless Advocates propose the City open the above mentioned “vacant” parcels near downtown, and the large “vacant” tract three miles to the east thereof. To make our proposal legally and politically viable, we must see it through the City’s eyes. Therefore, we attempt to address liabilities arising if the City were to open the vacant (unimproved) public lands for our stated purpose. Whatever liabilities each location poses to the City, and whatever advantages each poses to the proposed campers, the writer hopes this paper has invited the Fresno Homeless Advocates to engage in serious thought into the kinds of considerations necessary to formulate a viable proposal that would alleviate the living conditions of our longsuffering homeless communities. NOTES BY NORSE: Santa Cruz homeless activists have long demanded that Santa Cruz store rather than discard homeless property. I have had conflicting accounts of whether this is done, but rarely of people being able to reclaim their property. More recently a camper near “Nasty’s Camp”, the camp targeted by SCPD and sheriffs for seizure of their (legally grown) marijuana crop [http://www.santacruzsentinel.com/santacruz/ci_23880596/santa-cruz-police-clear-hundreds-pot-plants-trash?IADID=Search-www.santacruzsentinel.com-www.santacruzsentinel.com ] reported all her property twice stolen and dumped by workers affiliated with the city though she wasn’t charged with anything. 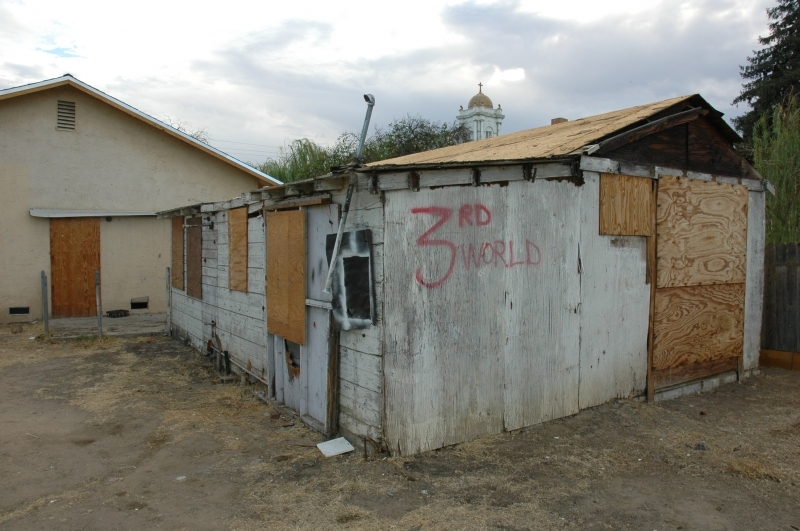 Santa Cruz is a much smaller community than Fresno and reclaiming property should be easier. Simply citing state law and the constitution clearly doesn’t do the trick if you don’t have the power of people on the street and perhaps attorneys behind you. Still I encourage any Santa Cruz homeless person who’s had her property taken by police post their accounts of whether they were able to reclaim it or not. Public exposure is much cheaper than trying to find legal help–though the possibility of Small Claims Court is still open. These photos show where the City of Fresno is temporarily storing property taken from homeless people during the sweeps over the last two months. The large blue tarps flap in the wind and catch your eye as you drive down south down H street, on your way to the center of downtown Fresno. 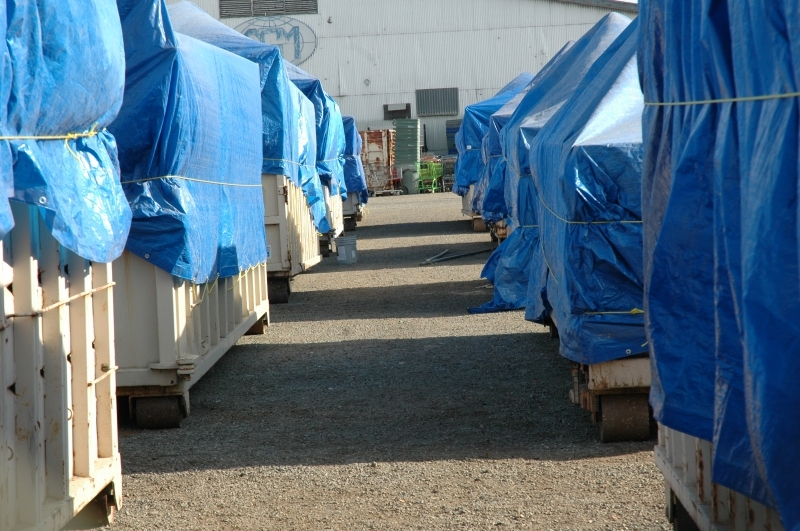 Few people know that this small city of blue topped storage containers is where the City of Fresno, complying with a Federal court order, has brought the confiscated property of homeless people, as they fled the destruction of their humble shelters. Today, the police are confiscating shopping carts filled with homeless people’s property and adding those to the collection – even if the owner of the property just left their property in front of the Poverello House while they got a bite to eat.This confiscation of homeless peoples property started about 2 months ago with the demolitions of downtown Fresno homeless encampments. It continues today as the police and city workers round up homeless people’s property and lock it away behind a barbed wire fence, guarded 24 hours a day/7 days a week, with very little chance that it will be given back to its owners. 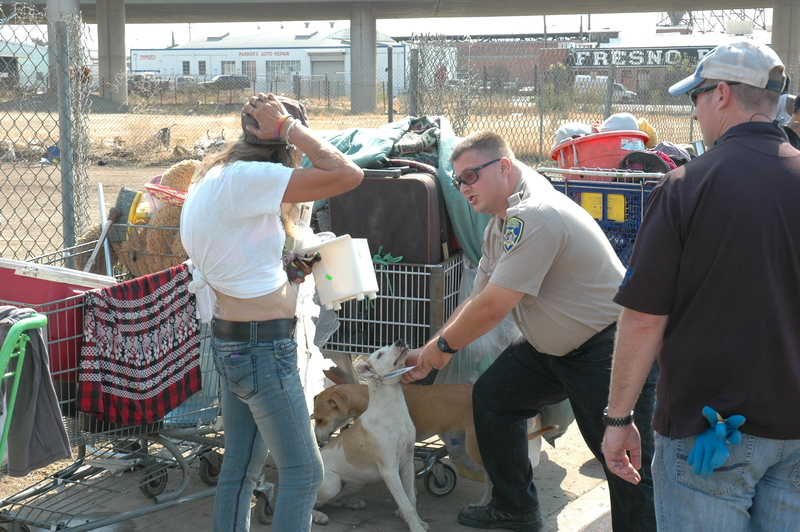 Even when homeless people are with their property, on the streets of Fresno, they are harassed by the police. In an incident that happened about a week ago, a group of homeless people were given “debris in road” citations. The “debris” was their blankets, food, and other items they need to survive. There is little chance that homeless people who lost all of their belongings in these raids by the police and city workers will be able to re-claim their property, because there is no place in the city that is currently safe for them to keep it. Nobody can carry everything they need to survive with them all day/every day. Therefore, the “technical” compliance with the Federal court order is simply a cover for the city’s ongoing policy of taking and destroying homeless peoples property, endangering their health, and decreasing their overall quality of life. The sergeant of the police task force charged with following the homeless to ensure that they do not resettle anywhere told me that the police were taking the shopping carts because the carts belonged to stores and would be returned to them, their rightful owners. 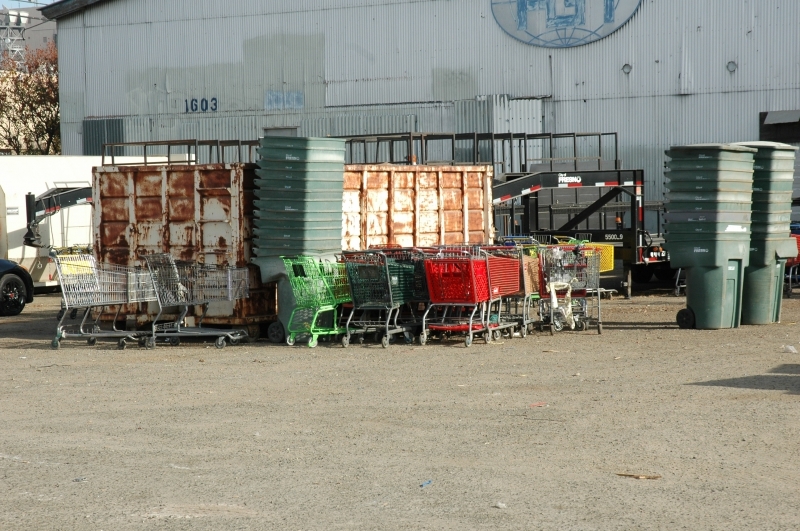 Apparently this isn’t true, as the carts remain lined up beside the storage containers. Are store owners clamoring for the return of their property? I’ve read nothing that indicates they are.The receipt given to a homeless person whose property is confiscated says clearly (on the bottom of the form) that a photo of the property is placed on the reverse side of the form. I have yet to see a single photo of any property. The idea that the City is complying with the court order is clearly a farce. 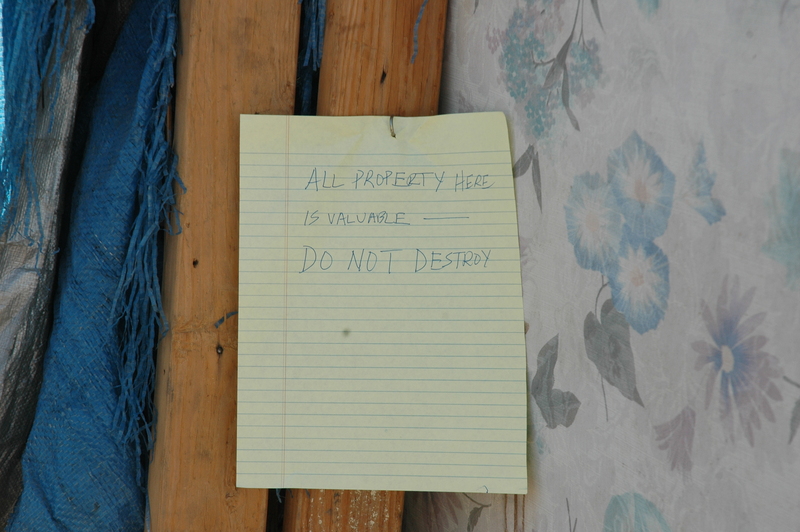 At the end of ninety days, the property, if unclaimed, can be discarded by the City. If the City isn’t doing so, it’s undoubtedly because they don’t have the resources (the personpower) to do so, not because they are holding it out of the goodness of their hearts. The idea that a homeless person is capable of reclaiming their property before the end of the ninety day period is likewise a farce, as this article states. Because they are homeless (and lack vehicles), they have no way to transport their belongings and no place to put them were they able to reclaim and transport them. It is time for all of us to stand up to the City, to insist on both emergency and transitional housing, for safe and legal campgrounds, for some form of housing for those without shelter of any kind. Contact your City Council member now! The temperatures are dropping into the 40s, into the range at which people can suffer from hypothermia. Can the City be held liable or found culpable in the deaths of any homeless people who have had the most basic of shelters torn from them? A possible question worth exploring …. It looks like it would be impossible for a person to find their belonging in those big containers. NOTE BY NORSE: A day before Santa Cruz’s Community Blanket Sit-in on Pacific Avenue (scheduled for 1-3 PM tomorrow in front of Forever Twenty-One on Pacific Ave–or whereever folks want to show on Pacific), Fresno activists engaged in active resistance to the Fresno homewrecker attack on the unhoused community ther Below is a brief update by Mike Rhodes, who will be on the stream of Free Radio Santa Cruz tomorrow (10-24) at 6:34 p.m. Tune in at http://tunein.com/radio/FRSC-s47254/. The City of Fresno continued their attacks on the homeless today by destroying the last encampment in the downtown area. The photo below shows one protester stopping a bulldozer as it tried to enter the encampment. The City of Fresno destroyed the last remaining homeless encampment in the downtown area today. The assault on the Grain Silo/Canal Bank homeless encampment started at dawn and continued throughout the day. 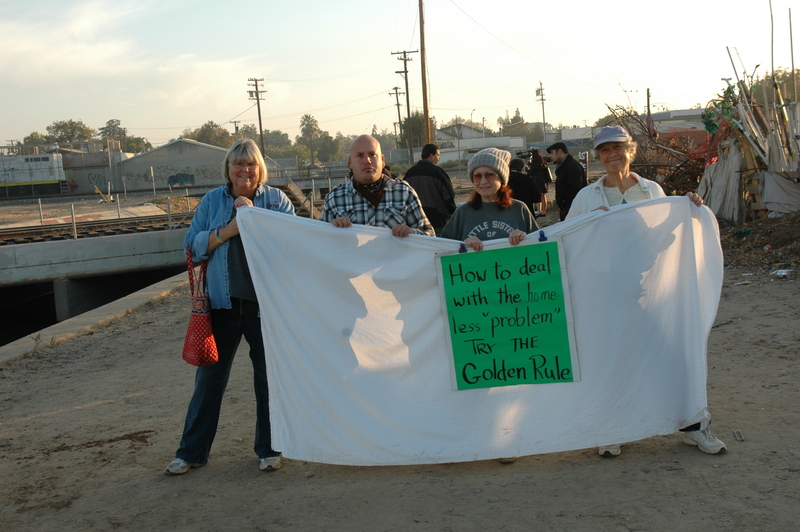 By 7:30 a.m. homeless advocates had blocked the two main roads into the encampment, preventing bulldozers and other city vehicles from entering.The city work crews shifted their strategy to focus on a handful of tents and other structures in a field on the other side of the railroad tracks. Bulldozers, garbage trucks, police and other support vehicles came down a dirt road on a canal bank to start the demolition. The handful of homeless people at that location were told to remove their property or it would be stored. 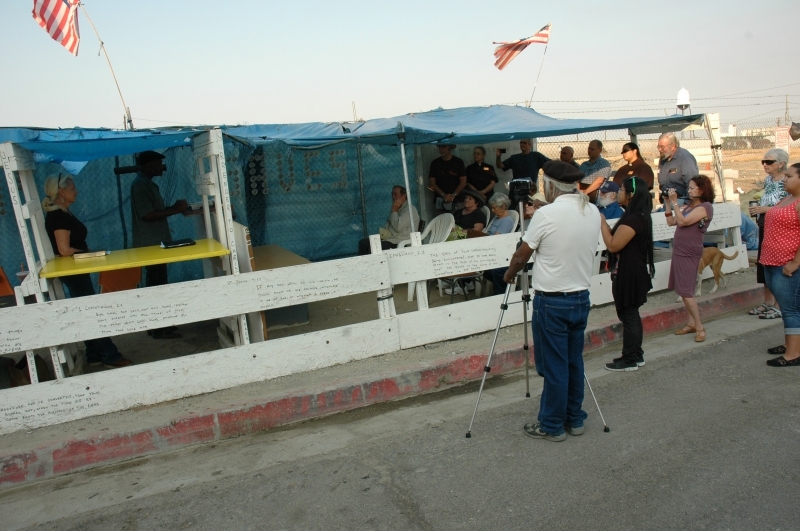 The destruction of the structures at that location took several hours, while the homeless advocates maintained their vigil at the main encampment. Eventually the city focused their attention on the much larger encampment and tried to bring in their bulldozers on a road that ran parallel to the railroad tracks on the south side of the camp. 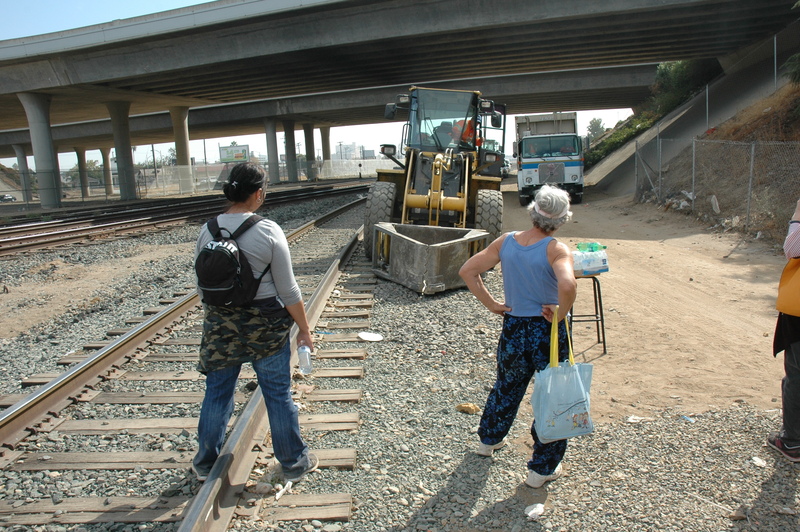 They were met by 10 – 15 homeless advocates who refused to allow the city vehicles to pass. After negotiations with Jim Betts, an attorney working for the City of Fresno, an agreement was reached to allow a U-Haul truck in to move some of the property. 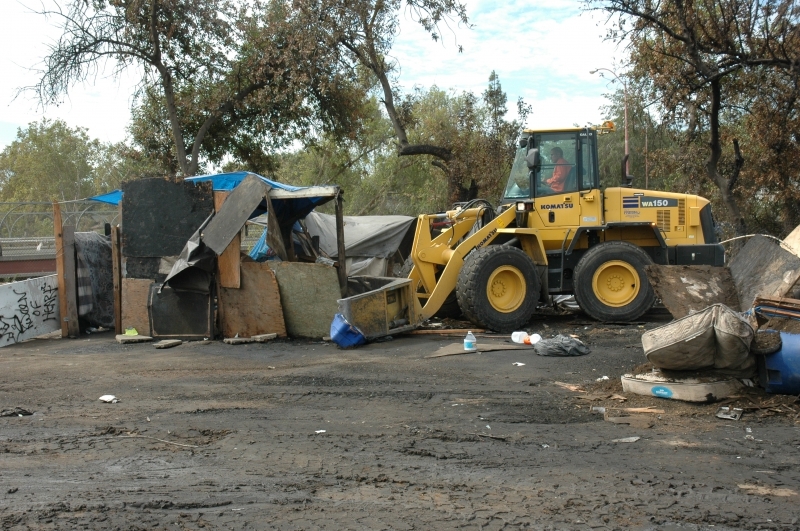 As the homeless and their allies were loading the U-Haul a second bulldozer came down a road at the north end of the camp. 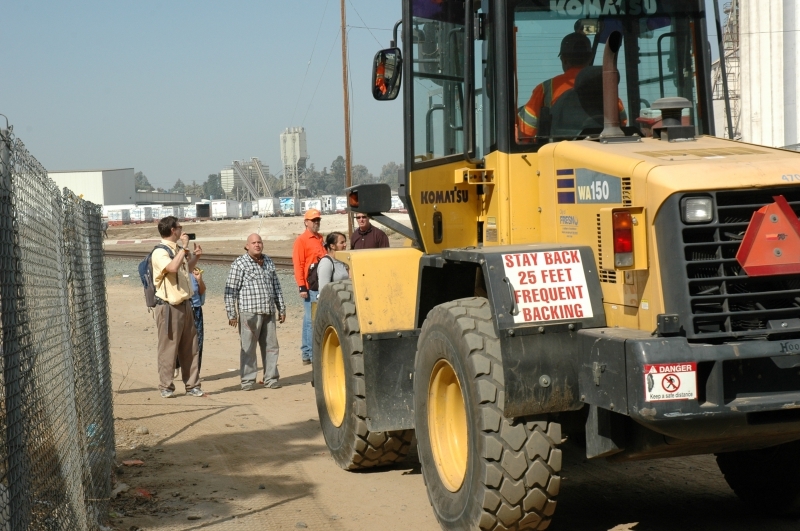 One of the protesters jumped on the bulldozers claw and the city soon withdrew that vehicle. The protesters, having gained time to help move the homeless, stepped back and two bulldozers and a garbage truck entered the encampment and started destroying what was left on the south end. It appeared that all of the homeless had moved out of that area and the property remaining had been stored. I had to leave by mid afternoon, but it appeared that the city would have the entire encampment leveled by the end of the day. Several City of Fresno representatives told me that a fence would be put up on Thursday to keep anyone from re-establishing an encampment at that location. 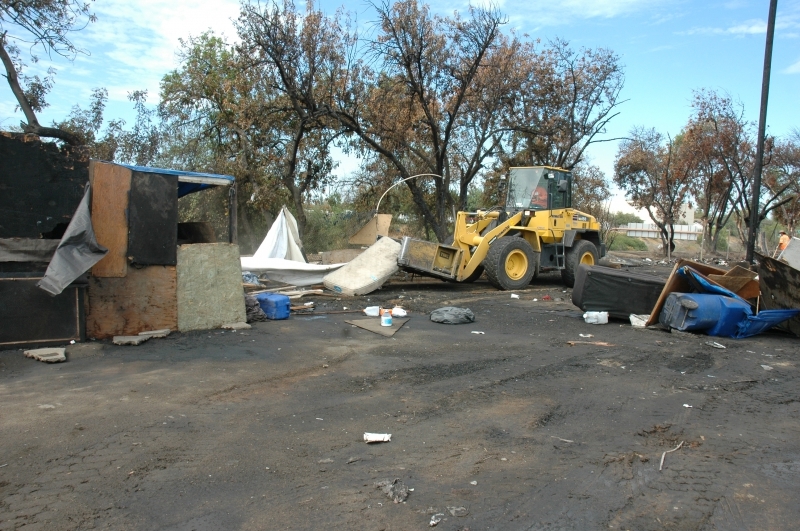 NOTES BY NORSE: Fresno activists provide portapotty facilities and trash pick-up’s for the surviving homeless encampments, and document the City’s destructive activities–as shown below. They have also prompted renewed ACLU legal activity to require the City to live up to the “store, don’t destroy homeless property” order of the $2.3 million Kinkaid settlement of 2007. Santa Cruz, by contrast, has no 24-hour bathroom, and its only concession to homeless (and indeed broader public) health and safety is to spend $15,000 on a segregated fenced-off portapotty (still projected with no actual facility yet set-up) on the San Lorenzo levee. The cost of renting a portapotty is $100 per month. Instead of using thr $15,000 to keep open bathrooms already there in San Lorenzo Park and the parking garages, Santa Cruz city council homeless-degraders are spending three times that amount to set up a “Security Gate” at the Homeless (Lack of) Services Center at Coral St.
NOTES BY NORSE: The kind of photographic and journalistic documentation of Santa Cruz’s calculated cruel crackdown on homeless camps is much needed—-and we can learn much from Fresno–where homeless activists have pressed successful lawsuits, provided the trash and waste disposal that the city refuses to provide to existing homeless encampments, and publicized abuses so regularly that the City is forced to respond with the kind of caution (though not really care) that is entirely foreign to Santa Cruz sweeps. Still no word from Councilmember Posner on the $15,000 bill for a lone portapotty being set up “as an experiment” near the San Lorenzo River at night (the only 24-hour shitter in town apparently). As I continually insist, the money could be far more effectively spent on opening existing bathrooms in San Lorenzo Park and at the Soquel and Front St. parking structure. What say you, Posner? No word either from City Attorney Barisone on the right of artists to put sales tags (i.e. visible prices) on their work on Pacific Ave. even though the clear White vs. City of Sparks decision forced Barisone to allow Rightsfinder Robin to do just that several years ago. (For the decision go to www.huffsantacruz.org and look under “Recent Legal Decisions” on the main page. HUFF meets tomorrow (9-4) at 10 AM at the Sub Rosa if folks wish to discuss and act on these issues. 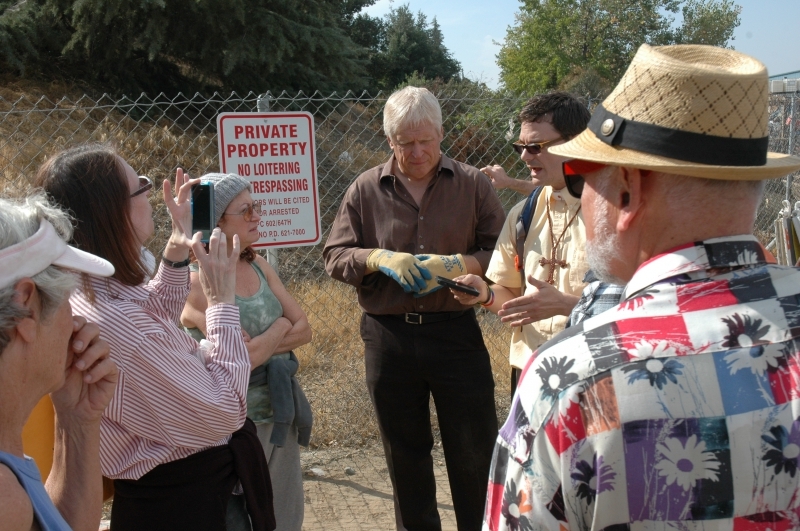 The author, Jessie Speer (center), with Ray Polk (left) and Larry Collins (right) at the H street homeless encampment, which the City of Fresno plans to bulldoze on Sept. 9. Imagine a young woman. Close your eyes and see her in front of you—her hopeful gaze, her restless hands. Now imagine one morning she can’t get out of bed. The doctor says it’s brain chemistry, but her family can’t afford the treatment she needs. 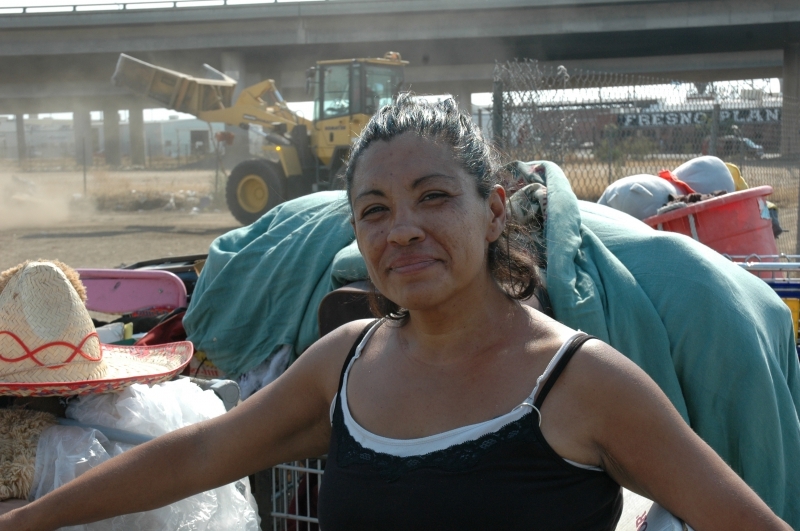 There is no shelter space, so she ends up living in an encampment on the banks of a canal near downtown Fresno. One day the city announces it will bulldoze her tent, destroying everything she has. 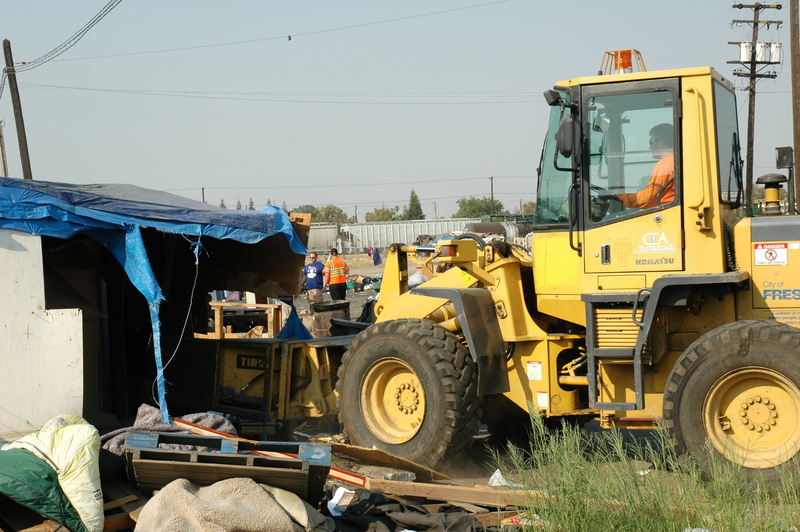 Several weeks later, the city announced its plan to bulldoze three major tent cities in downtown Fresno. It will not provide residents with alternative shelter. When I asked Police Chief Jerry Dyer what will happen when the homeless resettle in other neighborhoods, he said the police will remove every camp in the city and continue doing so as long as necessary. I wondered what would happen to Peaches. 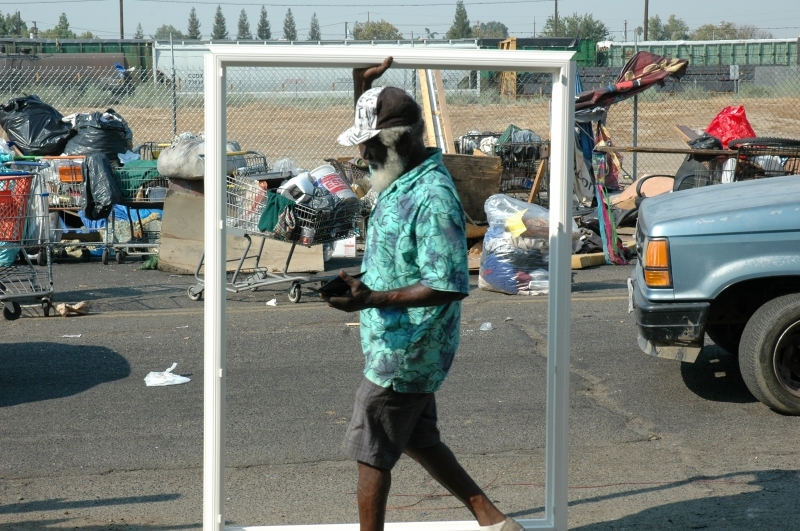 Fresno has the third highest rate of homelessness in the nation, and in 2011 it was the second most impoverished city. I came here to research how the local government was handling these high rates of homelessness and poverty. Over a two-month period, I interviewed more than two dozen politicians, shelter operators, community advocates and homeless people. I also attended community meetings and press conferences and read hundreds of pages of documents. I decided to write this article because I know firsthand that the homeless are not deviants. They are not separate and distinct from the rest of us. Like Peaches, the homeless are the mothers, fathers, grandmothers and cousins of the working poor in this community. Many homeless people work hard recycling or doing odd jobs all day long. Many people give away their last pair of clean socks to their neighbor or share their food with the community. And at no point during the hours I spent by myself at the camps did I feel threatened or unsafe. At their latest press conference, city officials repeatedly referred to a recent string of violent crimes as the underlying reason behind the city’s new policy. Yet several insiders informed me that the plan to destroy the camps predated these crimes. And when I asked Chief Dyer how many of these violent crimes were committed by homeless people, he admitted only one perpetrator was homeless. Should more than 3,000 unsheltered citizens be driven out of the city because of the actions of one person? The City of Fresno destroyed Yellow Feather’s shelter and confiscated her property. She now sleeps on the sidewalk near the Poverello House. 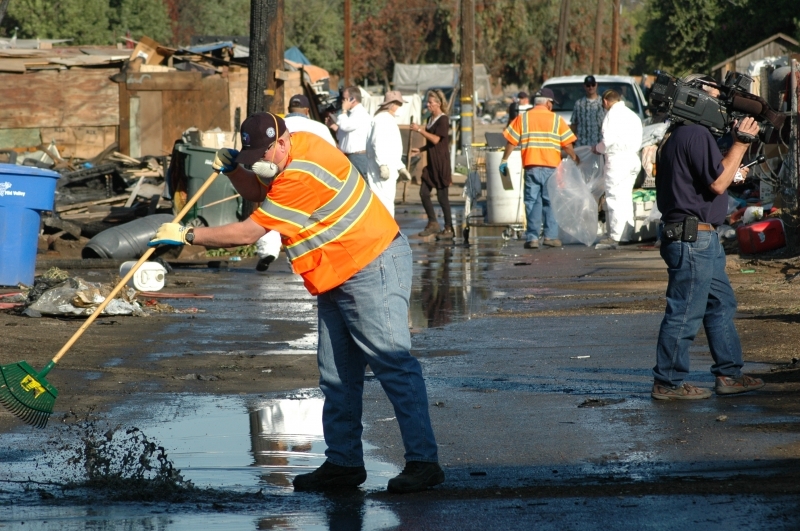 Imagine a massive flood hits north Fresno and hundreds of middle-class homes are destroyed. 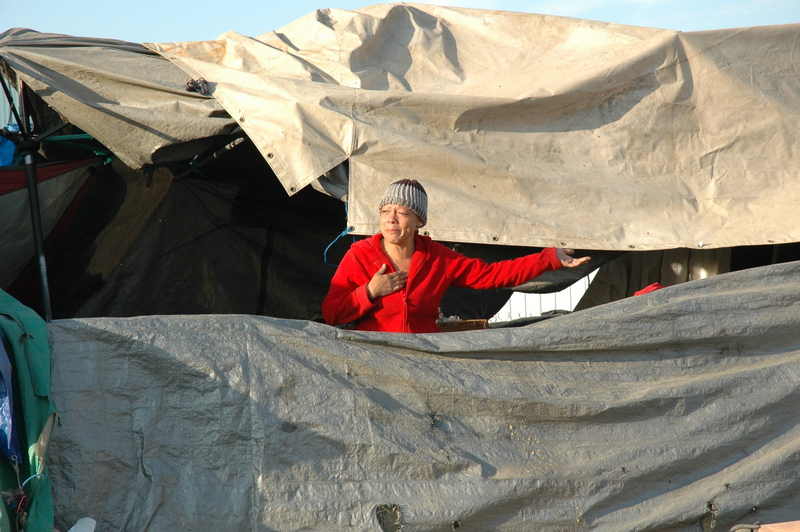 Of those affected, some don’t have anywhere to stay and begin living in tents to survive. Would you expect the community to come forward and help them, or should the community destroy their tents and drive them out of the city? I’m sure most Fresno politicians wouldn’t hesitate to help middle-class families get back on their feet. We would never think to blame middle-class flood victims for their tragic circumstances. But a pervasive and historic ideology says that poor people are somehow less deserving of kindness. Aristotle wrote that wealth is a prerequisite for goodness. Milton Friedman, one of the fathers of American neoliberalism, argued that the poor are the losers of the capitalist system. In this way, poverty becomes justified, and society is no longer responsible. But these luminaries forget that one’s lot is usually the luck of the draw, not a personal achievement. You are born with money, or you are born without it. And when you are born without money, you cannot afford disaster. Being laid off, missing a rent check, being arrested, getting sick, losing a loved one, surviving violence, getting hooked on drugs—every person I talked with who is living on the streets suffered from one or more of these problems. The middle class and the wealthy have problems too. The difference is that their families will step in to pay for rent, quality healthcare, rehab or a lawyer. But for those already struggling with poverty, any blow can easily lead to homelessness. And once someone is living on the streets, it becomes harder and harder to bounce back, as physical health declines, depression sets in and drugs become a means of escape and self-medication. As a society, we have several choices. We can help each other, we can do nothing or we can chase our poorest citizens out of town. 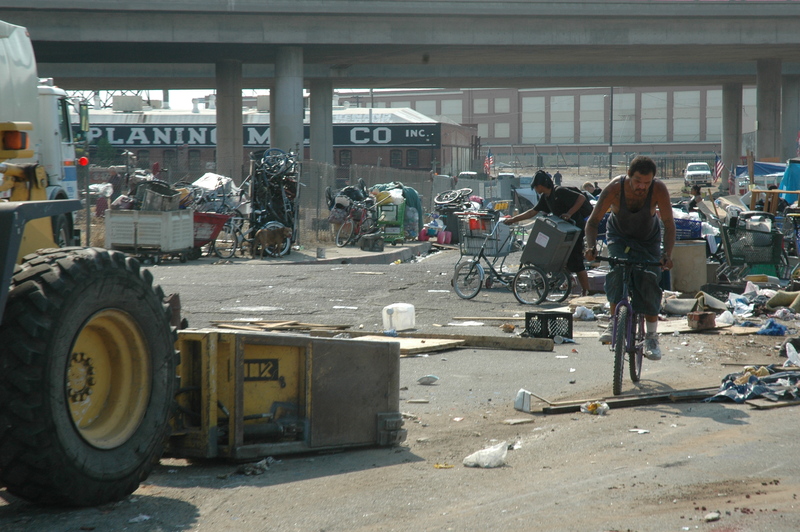 For years, Fresno chose the second option and did nothing to house the majority of its homeless population who lived in sprawling downtown encampments. But when these camps began to receive negative press, the city started a campaign of destruction. Over the course of a two-year period beginning in 2005, the city bulldozed at least 50 camps. During the raids, bulldozers came at odd hours and crushed all structures. Several residents lost their animals. On one occasion, a man crawled out of his tent moments after an activist prevented it from being bulldozed. On another occasion, a Fresno police officer pushed a woman’s shopping cart into an irrigation canal of rushing water. The woman lived on a breathing machine due to severe asthma and had to attempt to replace her identification, birth certificate and medical records in order to requalify for disability. 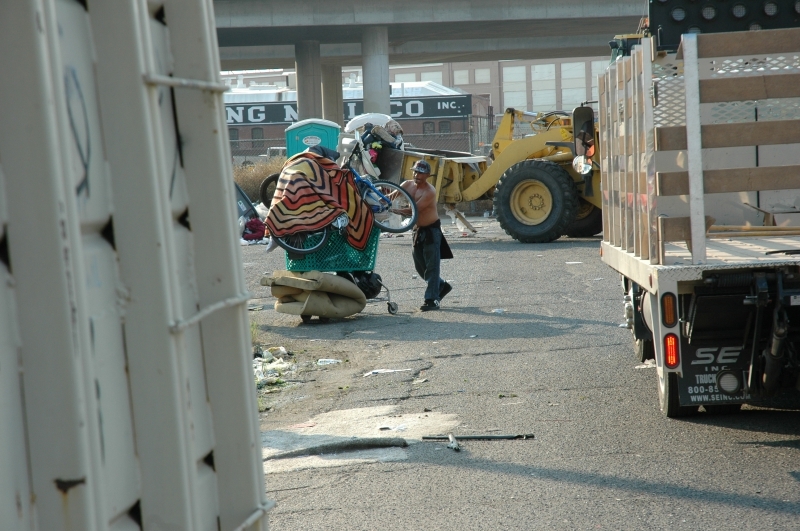 In the wake of a lawsuit filed against the city in 2006, the sweeps slowed and tent city residents enjoyed a temporary reprieve. But the sweeps happened again in 2011, and again civil rights lawyers filed suit. 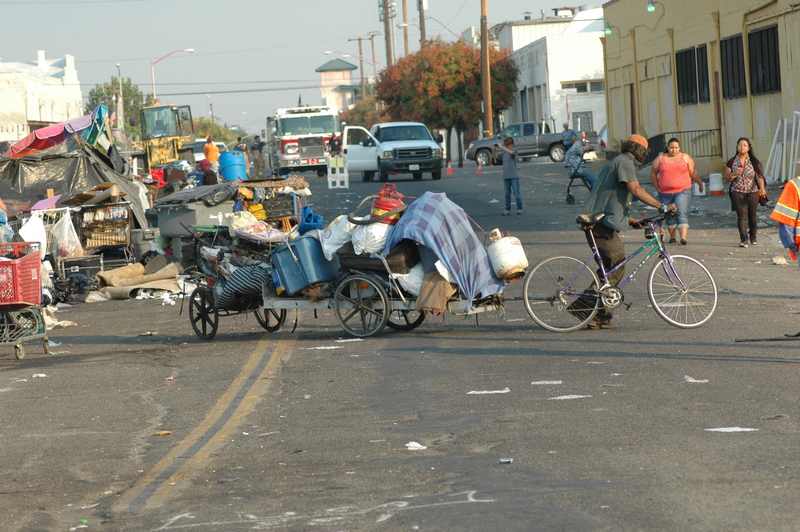 Fresno officials I spoke with unanimously claimed that the lawsuits prevented them from doing anything about homelessness, when in fact the lawsuits only prevented them from unconstitutionally destroying people’s property. As a corollary to this brutal and expensive policy, any attempts to create shelter options for the homeless have been seriously flawed and underfunded. In 2006, only 2% of the city’s homeless population was sheltered, and no new temporary shelters have been constructed since then. Currently, one of Fresno’s only emergency shelters is operating at less than 10% capacity because its executive director ousted anyone who uses a cellphone, who doesn’t pray and repent to Jesus on a daily basis, or who has any source of income. As one homeless man told me, this shelter is “worse than prison.” And many Fresno shelters have similarly draconian rules. Meanwhile, attempts at securing permanent housing for the homeless in Fresno have been plagued by corruption. 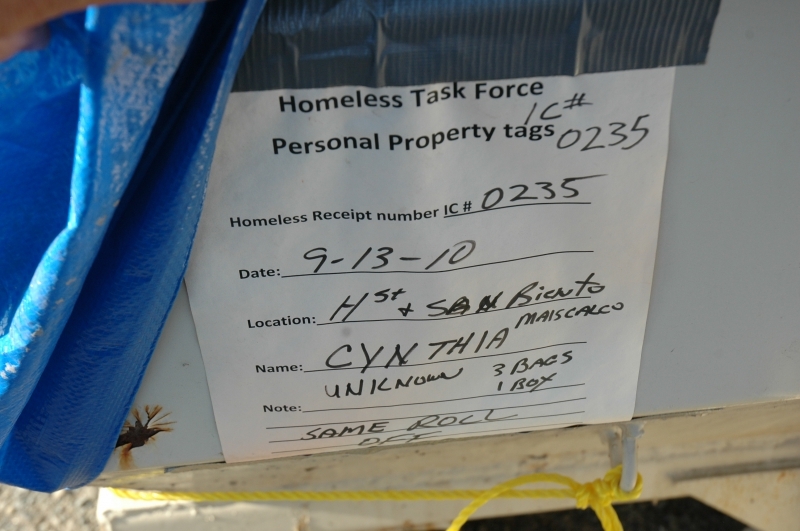 In 2010, when the city received an $11 million federal grant for permanent housing for the homeless, the money was given to a private developer to construct a small housing facility. The chair of the board that allocated the money also happened to be the CEO of the company that constructed the building. This facility now stands as the exemplary model for future housing for the homeless. Thus, homelessness has become an industry in which various developers, shelters and service providers vie for government money. These problems can and should be addressed. But the city is so focused on driving the homeless out of town that the time and resources needed to do so are sorely lacking. During my time here, I faced the real, everyday humanity of the people who are living on the streets of Fresno, and I can no longer remain impartial to the city’s policies. The way Fresno handles homelessness is not only rooted in an inhumane ideology, it is also irrational. This city has tried this tactic before in 2005 and 2011, and in both instances it failed. Homelessness is still a persistent problem. It’s time for a new tactic. Jessie Speer is pursuing a master’s degree in geography at Syracuse University. Contact her at jlspeer@syr.edu. About 30 members and supporters of the Fresno Coalition for Humane and Affordable Housing Policies held a press conference on Aug. 26 on the corner of Santa Clara and G streets to announce their opposition to the city’s planned demolition and to launch a petition drive asking the city to halt the razing of the camps and address the issue of homelessness in a humane and effective manner. 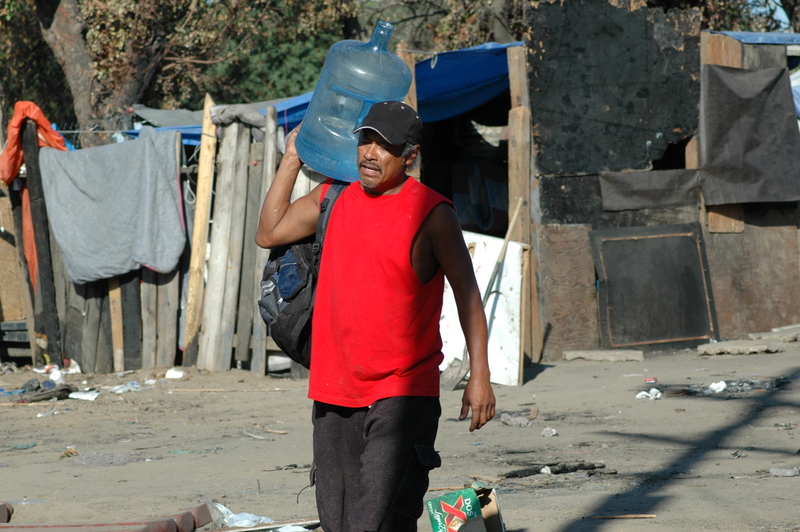 The Coalition’s petition has been uploaded to a Web site created by the group at www.helpfresnoshomeless.org/. “Our group believes that demolishing homeless encampments is inhumane,” said Coalition member Mary Ellen Carter at the press conference. “The city’s plan to offer alternative housing to the people who live in the encampments is woefully inadequate. 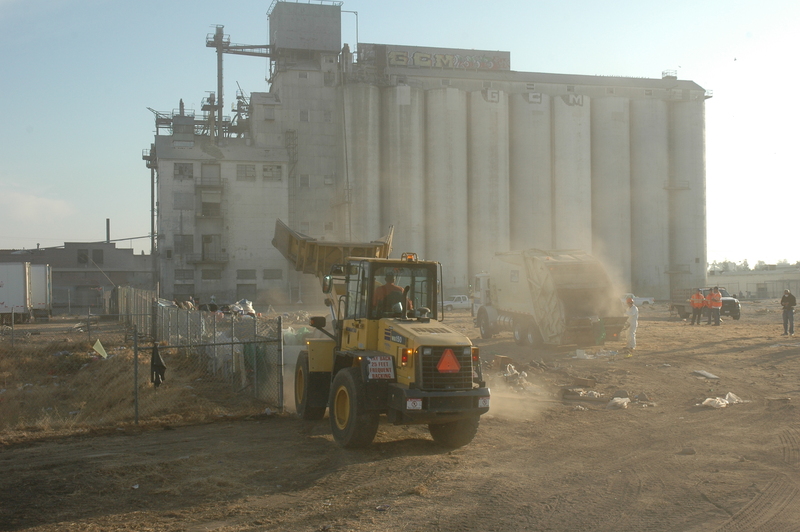 The city’s first day of the demolition went ahead as scheduled. Crews bagged and boxed homeless people’s property, taking it to a storage location where they say it will be available for retrieval for the next 90 days. Then the bulldozers moved in destroying couches, shelters and anything else left behind. Although the city workers store tents, they plowed through wooden shelters and put the remains into the back of waiting garbage trucks. 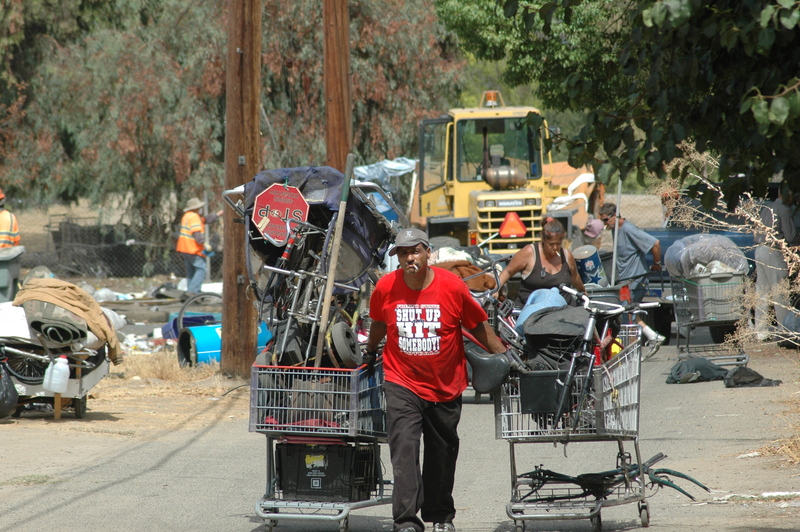 A group of homeless men who attempted to get away from the demolition of their shelters were stopped on the other side of the street by Caltrans workers who told them they could not bring their shopping carts onto Caltrans land. 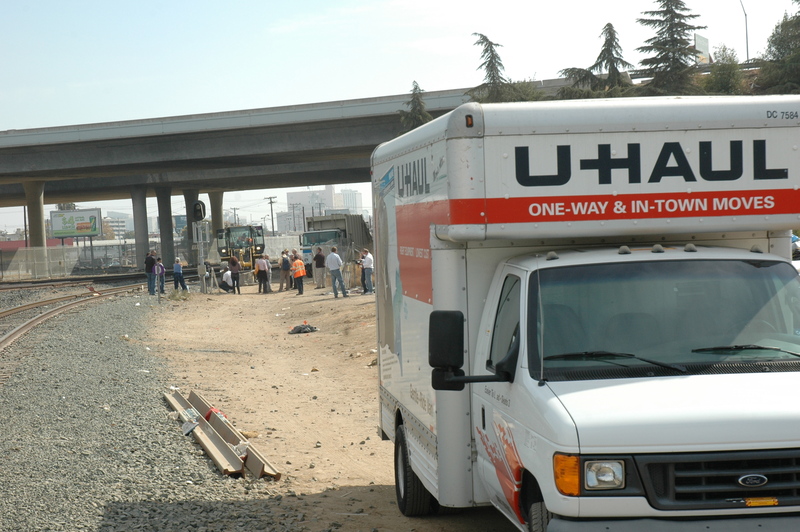 In a minute, they were joined by a California Highway Patrol officer who provided additional urgency to the Caltrans workers’ demand to leave their vacant lot. The homeless have no place to sleep that is safe and legal. Although city representatives are telling them that they will not stop them from sleeping on the sidewalk at night, some women like Yellow Feather wonder out loud how this new city policy is supposed to help them. NOTES FROM NORSE: Mike Rhodes, writer, activist, & photojournalist with the Community Alliance newspaper, the Fresno Homeless Advocates, & many other groups writes regularly at www.indybay.org/centralvalley where further comments on this story reprinted below can be posted. In Santa Cruz, homeless people who had lived on private property with the permission of the owner reported their encampments and structures were destroyed and their property was stolen by sheriff’s deputies and SCPD marauders in several seize-and-spoil operations in the last few weeks. A marijuana crop was confiscated (or robbed, as homeless people saw it) even though they claimed at least ten of them had medical marijuana cards. This happened both near highway 17 and another encampment some distance away. I’ll be playing those reports Thursday September 8th on the stream of Free Radio during my show 6-8 PM at http://tunein.com/radio/FRSC-s47254/. 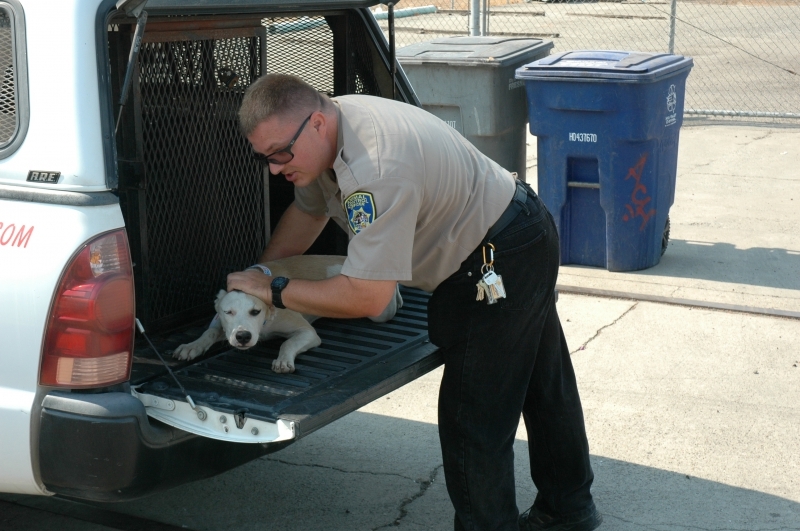 HUFF will meet tomorrow at 10 AM at 703 Pacific to discuss this issue further. 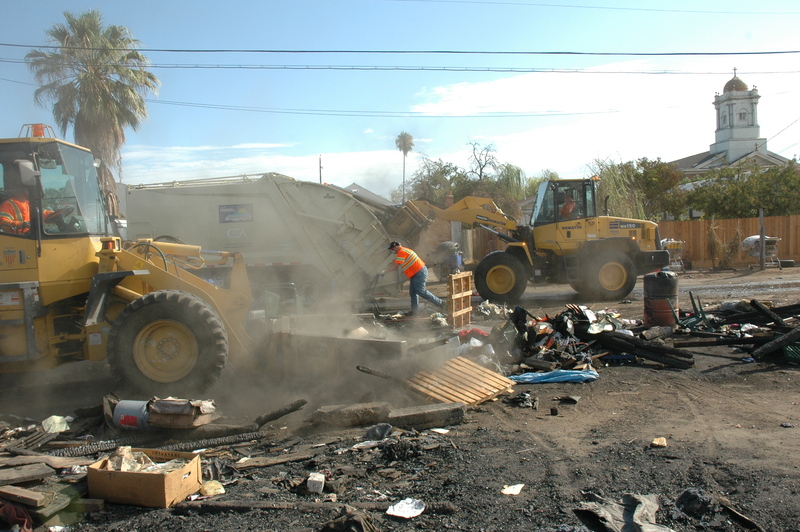 The City of Fresno is in their second week of destroying homeless encampments in the downtown area. The photos of the demolition and people trying to escape (below) are from the encampment that is located between E street and highway 99 with California Ave and San Benito on either end of the encampment. These photos were taken on Tuesday, September 3, 2013. The city work crews gathered at 7 a.m. and were soon walking through the encampment telling the homeless residents that they have to move on. Most homeless people I talked to did not have anyplace to go. 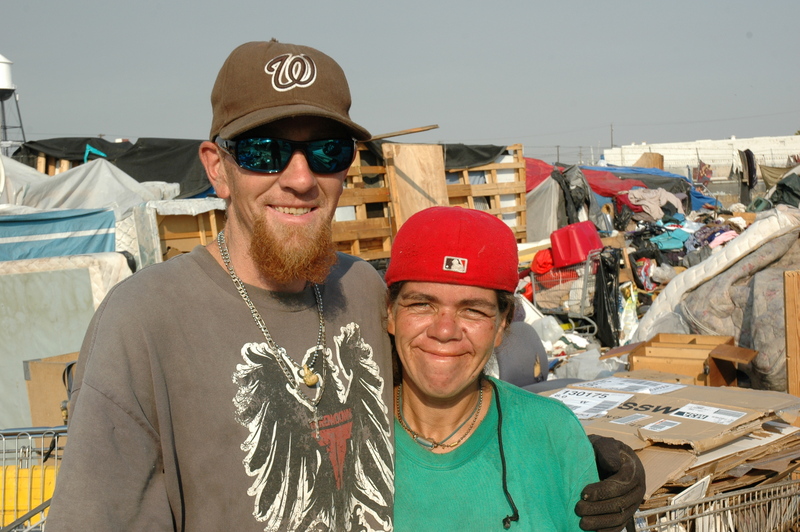 Several said they would go to the H street encampment that is scheduled to be destroyed (by the city) next week and some said they would sleep on a nearby sidewalk. As I arrived at about 6:30 a.m. some people were still sleeping on sidewalks by the Poverello House, the location of last weeks demolitions. It was the Poverello House, which is a social service organization that provides meals for the homeless, that pushed the city to destroy the homeless encampments. They argued that the encampments, with their run down appearance and alleged crime was preventing clients from entering their facility. The demolition today followed a pattern that played out last week near the Poverello House. After the city’s attorney and sanitation workers walk through the encampment (with multiple video recorders capturing every conversation), they offer the residents bags to put their property in. If they have a lot of property, the city brings in a large 8 x 8 x 20 foot container. While property is being stored, the bulldozers start clearing out unwanted property and trash that has been left behind. 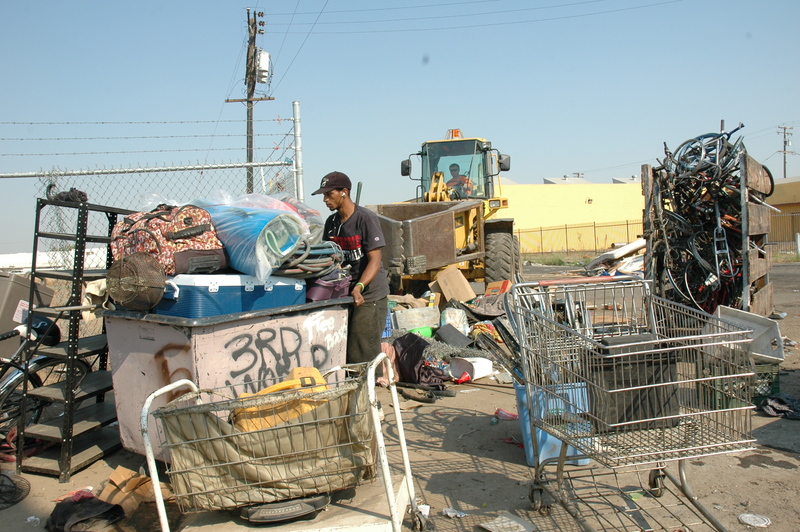 Soon, the bulldozers are tearing into the shelters as many of the homeless are still pushing shopping carts away. Eventually every last shelter will be destroyed, property will be stored for 90 days, and the homeless will have no place safe to sleep tonight. This house sits right across the ally from the homeless encampment. At least 1/2 of the homes in the neighborhood are boarded up and abandoned and yet you have homeless people living all around the area. 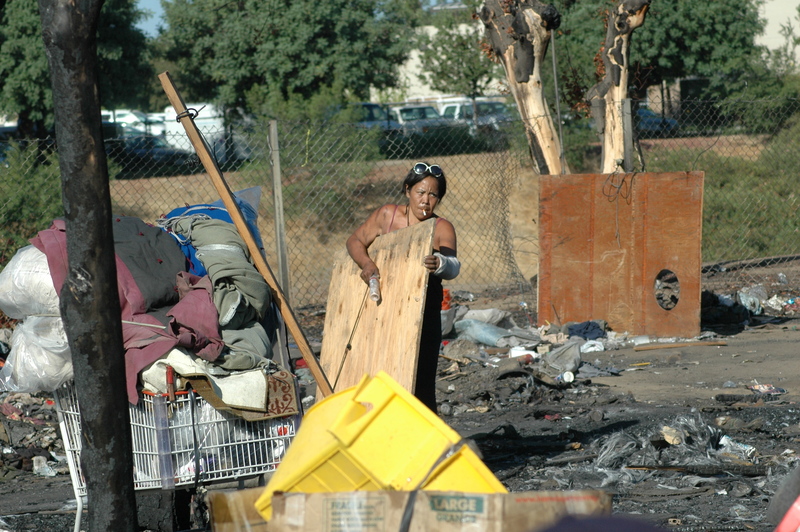 The City of Fresno, though also attacking homeless encampments, has also been set back by successful lawsuits. Plus the sheer volume of homeless people setting up camp in these houseless times because they have to. 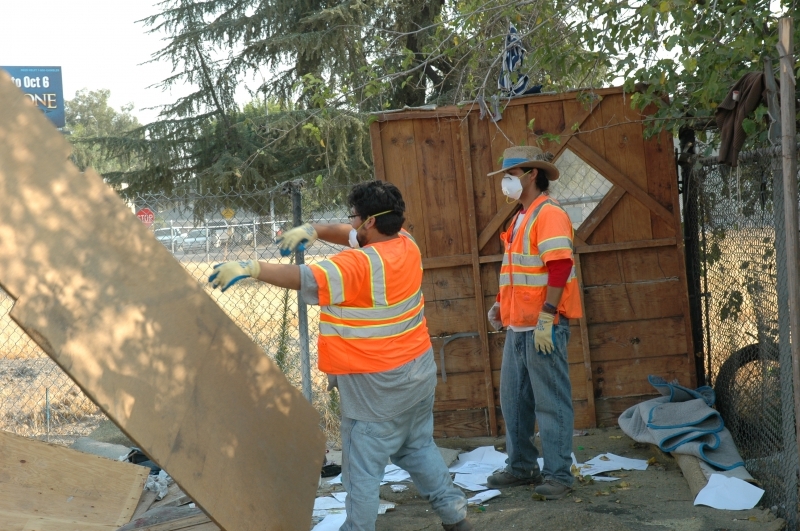 In response Mike Rhodes and the Fresno Homeless Alliance has been providing TP and dumpsters as well as servicing to deal with the public health crisis that the City will not. Santa Cruz activists, contemplating encampments here, might cast an eye Fresno-wise. This afternoon I delivered the last 30 rolls of donated toilet paper to the homeless encampments in downtown Fresno. As you may know, we have seven portable toilets in 4 different encampments and they go through a lot of TP. I have hired a homeless guy to supply each of the portable toilets with TP each day. He puts 3 rolls in a locked dispenser and keeps the portable toilets free of clothing and other trash. It is really working out great, except that now we are completely out of TP. If you can help, please drop off packages of TP to my office at the Fresno Center for Nonviolence, 1584 N Van Ness (on the southeast corner of Van Ness and McKinley). We are open Monday – Friday from 11 a.m. – 3 p.m. You can also call the center at 237-3223 – Richard Gomez is often there before or after regular hours (and weekends) and can let you in to drop off the TP. Alternatively, you can send a check to The Eco Village Project of Fresno, C/O Mike Rhodes, 4773 N Arthur Ave, Fresno Ca 93705 and we can buy TP in bulk at wholesale prices. Either way works, but we need to do something soon. Also, we have placed a couple of large trash bins at 2 of the homeless encampments and that is helping to keep them a lot cleaner. Again, I’m hiring homeless people to do the difficult work of clearing the garbage from the encampments and putting it into the dumpsters. This has been going on for a couple of weeks now and you can see a big difference in the encampments where we have located the trash bins. You can help support this effort by sending a check to the above address.